GERTIE C. TAYLOR was gifted to this world on July 13, 1928 in Richmond Virginia. She was the fourteenth of fifteen children born to Johnny and Jimmie Hardy Cunningham. She received her formal education in Richmond, Virginia and graduated from Armstrong High School. Growing up, Gertie was a loving and devoted caregiver. Being the youngest daughter, she loved and cared for a host of nieces and nephews in their formative years. Gertie was very close to her mother and enjoyed helping with sewing and domestic work. She later joined her mother working in the cafeteria at West Hampton Jr. High School. She was baptized at a young age at Westwood Baptist Church in Richmond, Virginia, under the leadership of the late Reverend McCrary. She sang soprano and was a member of the church choir, and was active in various auxiliary groups. Gertie was united in marriage with Melvin L. Taylor, Jr. in 1954 and moved to San Diego, California shortly thereafter. Blessed of this union were five children, Donna, Myron, Marvyn, Gail and Melvin, III. She was a devoted wife and mother who supported and encouraged the aspirations, ideas and endeavors of her husband and children. She assured that her children would experience a well-rounded childhood. She introduced them to the world of music through an assortment of music lessons for the accordion, clarinet, violin, drums and organ. She inspired their interests in the Cub Scouts, Boy Scouts, Brownies, Girl Scouts, Y-Indian Guides, Little League baseball and softball, football, modeling and choir. 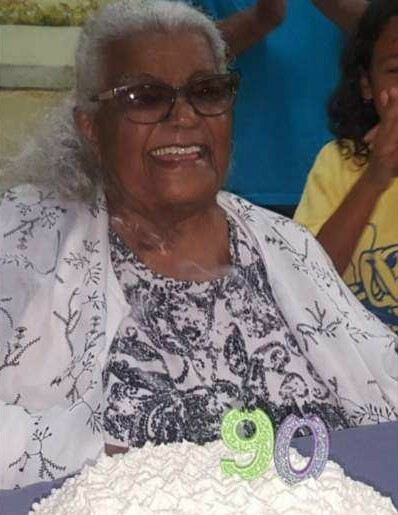 Gertie was very supportive of her children’s interests and served in the capacities of Den Mother, an active longstanding member of the Parent Teachers Association (PTA), and served as a Yard Duty monitor at the elementary school and junior high school levels. She saw the interest in her children concerning pets and tolerated a variety of mammals, reptiles, fish and fowl. after twenty-eight years of service. Her interests were wide and varied, she was an avid bowler and an active member of a bowling league, and she loved playing Bingo, Gin Rummy, and Pokeno with friends. Gertie enjoyed going to the casino, shopping at the Saturday Boutiques, and was always fascinated with the latest in electronics. She had a smart phone, a tablet and was quite active on her laptop. She thoroughly enjoyed her Word Find Books as her motivation was to keep her mind sharp. Throughout her years, she remained mentally sharp and provided wisdom and sound advice to many. She was fun loving, loved living and remained adventurous throughout her lifetime. She especially enjoyed the many adventurous excursions by surprise with her eldest son, Myron. Gertie was a constant inspiration, encouragement and support to her children, grand- children, great-grandchildren, family members near and far, dear friends and even to strangers. She was known for her heart of giving and was always shopping for others. She enjoyed fulfilling a need or desire through her own observations, or through a by-the-way conversation. When she discovered a need she endeavored to fulfill it, or provide a resource to ensure the need was addressed. She would buy groceries for others, open her home as a safe haven and a refuge, she made and delivered delicious meals for special needs, and she was a supportive friend at the midnight hour. She gave of her time, her talents, her treasure and her resources without hesitation. She was truly a blessing to all who knew her. Gertie was preceded in death by her parents, thirteen siblings, her husband, her daughter Donna Walker, her granddaughter Kimalith Walker, niece Mary Griffin, nephews Donald Griffin, Arthur Ashe, Jr., and Kevin Morgan, and dear friends, Mary and Vell Wyatt, Shirley Gordon, Izetta Chambers, and Lois Wolverton. On Friday, January 25, 2019, Gertie joined hands with her Savior as He called her from earthly labor to eternal rest. She leaves behind to cherish her memory and carry forth her legacy her children, Myron Z. Taylor, Marvyn Z. Taylor (Ken), Gail Y. Taylor and Melvin L. Taylor, III (Maria); son-in-law, Harold Walker; grandchildren, Joseph Taylor, Chardonnay Walker, Lilian Walker, Gabriel Harvey, Naomi Harvey, and Melena Taylor; great-grandchildren, Zamani Boyd-Taylor, Vasanti Boyd-Taylor and Treyvon Green; sisters, Roberta Morgan of Oak Harbor, WA, Odessa Staggers of Hayward, CA; sister-in-law, Marilyn Cunningham of Richmond, VA; best friends, Fanny Reed, Wanda Morales and Pat Strickland; extended families, The Chambers’, The Reed’s, The Morales’, The Muro’s; and a host of cousins, nieces, nephews and friends. compassion for others live forever.